People in Wrigley, N.W.T., had an opportunity this week to vent their frustrations to the National Energy Board about an oil spill near their community this spring. In early May, a local hunter discovered oil leaking from Enbridge's Norman Wells pipeline near the Willowlake River, about 50 kilometres south of the community. 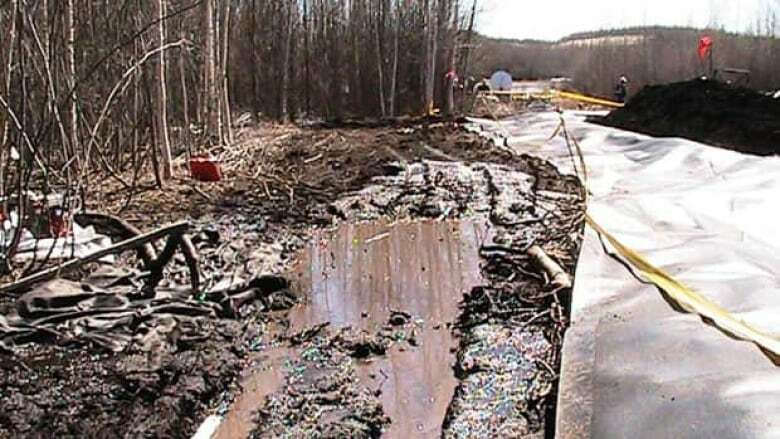 Enbridge originally said only four barrels of oil had leaked into the environment, but the company later revised its estimate to somewhere between 700 and 1,500 barrels. Crews are cleaning up the spill. Officials with the NEB travelled to Wrigley this week to meet informally with Pehdzeh Ki First Nation Chief Tim Lennie and his council, but Lennie invited the entire community to join the meeting as well. "We expressed our feelings, our thoughts, our aspirations, our frustrations," he told CBC News on Thursday. "At times, maybe, they felt the anger. But I feel it was productive." Lennie said people raised concerns about the oil spill's potential impacts on residents' health, as well as the health of area wildlife that people hunt for food. Some expressed concern that the continued cleanup near the Willowlake River may interfere with their fall hunt, while others feared an even larger pipeline leak or spill could happen someday, he added. "A lot of people want scientific information, you know, they want technology to prove that there's something wrong about the effects to the human [and] … the effects to generations to come," Lennie said. "What kind of mechanism [are we] going to put in, in the next number of months, to safeguard our people? Who's going to relocate my people to harvest in another area?" Lennie said many residents also felt they have been kept in the dark about Enbridge's cleanup efforts to date, but he added that people will get a chance to talk to company officials next week. Earlier this month, Enbridge gave the community a 674-page draft remediation plan and an initial deadline of July 20 to review the document before it is sent off to the NEB. Lennie said the company is now offering Wrigley $5,000 so the community can hire experts to analyze the cleanup plan. But the chief said that amount will not be enough to get the job done.